in a basement closet. 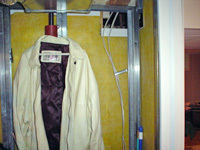 Exposed fiberglass is also common in unfinished portions of basements finished with this kind of wall system. In recent years, there has been a big influx of homeowners insulating their finished basement walls with wall panels that use fiberglass insulation. Some large companies have also joined the bandwagon, creating basement finishing products that are manufactured with fiberglass insulation. The issue is that while fiberglass insulation works well in upper levels of the home, it's one of the worst insulation options available for a basement remodeling project. Silver River Basement Systems of Colorado proudly finishes basements in Colorado Springs, Pueblo, Durango, Florence, Dolores, Canon City, Pagosa Springs, CO and nearby, using only the best practices and products available. Call or e-mail us today for a free basement finishing estimate! 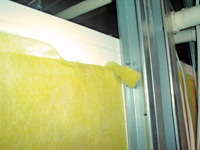 Fiberglass insulation rarely goes all the way up the walls, leaving open spaces where heat can escape. Metal stud mounted on foundation walls will also conduct heat away. Fiberglass basement insulation is a less-effective insulation option, when compared to closed-cell insulation or spray foam insulation. 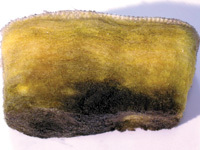 It can absorb water from flooding and humidity, losing much of its insulative R-value as it becomes saturated. And if the insulation is compressed in any way, it will also become less effective. More importantly, fiberglass batt insulation is installed in an unbroken sheet on the basement walls. There will be open air along the top of the insulation, and over time, the fiberglass will often settle, increasing the size of the gap on top. Additionally, fiberglass and fabric basement wall panels cannot support the weight of cupboards, bookshelves, or other heavy objects. When they're installed, the insulation must be cut away, so they can be mounted directly to the foundation wall. These openings give heat a way to escape from your home, significantly reducing its energy efficiency. Think of it this way: How warm could you keep your house if you had a window open all the time? If you have large openings in your insulation, you can expect the same results. Mold can easily grow on fiberglass and fabric-based basement wall panels, especially during a flood. While fiberglass itself is inorganic, not all the materials that are in a completed fiberglass batt insulation are. For instance, the paper facing that is too-often included on fiberglass basement finishing panels can grow mold easily, as are the resins that are often used in the fiberglass to attach it to the backing. Foil backings can be effective for protecting this fiberglass from humidity, but the newer black plastic coverings include perforated holes- holes that can allow humidity and water into the insulation. And since fiberglass is not naturally pink or yellow, we know that pink or yellow fiberglass has been dyed; that dye contains urea, an organic material that can and does grow mold. We've seen hundreds of basements that have been ruined by moisture and water over the years, and we know just how easily fiberglass gets moldy! 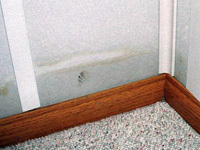 When fiberglass basement walls get wet, the dyes leak and stain the fabric. And fabric walls are very hard to clean! HGTV recommends installing fiberglass batt insulation with the facing pointed towards the warm side of the wall. This means that if the batt is properly installed, your fiberglass insulation will be pressed directly against the wall, where it can absorb moisture and humidity directly from the basement wall. If the basement leaks with groundwater or it floods through your pipes, washing machines, basement windows, water heater, sinks, toilet, tub, shower, or anywhere else in your home, you can say goodbye to your fiberglass insulation. Fiberglass soaks up moisture like a sponge and its dyes are water soluble, meaning that once the flood has come, your walls will be stained and the fiberglass will be soaked, and no longer effective as insulation. Of course, once the fiberglass is wet, it is also its most susceptible to mold, rot, and mildew growth. Installing Total Basement Finishing wall panels, with closed-cell polystyrene basement insulation. Instead of fiberglass insulation, Silver River Basement Systems installs closed-cell polystyrene insulation as part of the finished basement wall panel system they provide. Designed by Total Basement Finishing, each insulated wall panel includes an incredible 50-year written warranty to resist mold and damage from humidity or flooding. 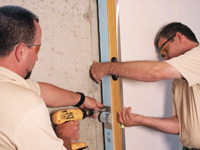 Created with dense insulation and a hard 1/2" cementitious board, these panels are 197% stronger than traditional drywall construction. Their vinyl covering makes them beautiful and easy to clean for the life of the home. And unlike fiberglass insulation, this free-standing wall panel can install on the walls or as a partition with no need for studs! We can finish a basement, from floor to ceiling, in about ten days, and the warranties that come with the products last for decades! For a FREE, no-obligation basement finishing design quote, call or e-mail us today! 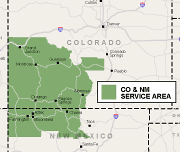 Silver River Basement Systems serves Colorado Springs, Pueblo, Durango, Florence, Dolores, Canon City, Pagosa Springs, CO and other parts of CO.